On February 20, 2012, Chhouk Bandith, then the governor of Bavet in Cambodia's Svay Rieng province, was reported by multiple witnesses to have opened fire on a crowd of protesters at a Puma factory, injuring three. Despite the severity of the crime, the Svay Rieng Provincial Court sentenced the former governor to the light sentence of 18 months in jail for the ‚unintentional‛ causing of injury. Human rights watchdog groups have observed that this case exemplifies Cambodia's culture of impunity and the disinterest of the judicial system in pursuing justice for victimized labor activists (Khuon, 2013, paras. 1-13). This and similar cases of violence, including the 2012 murders of the environmental journalist Hang Serei Oudom and the environmental activist Chut Wutty, reflect the violence of Cambodia’s neoliberal development, which has intensified with the country’s spectacular economic growth (Licadho, 2012, para. 6; Kuch & Chen, 2013, paras. 1-10). 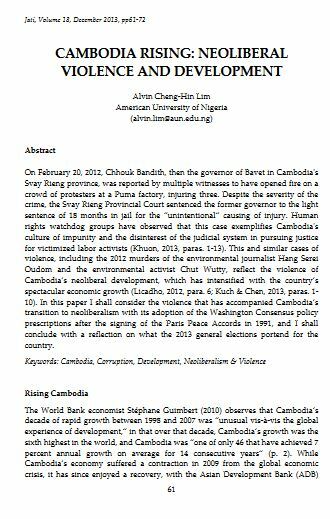 In this paper I shall consider the violence that has accompanied Cambodia’s transition to neoliberalism with its adoption of the Washington Consensus policy prescriptions after the signing of the Paris Peace Accords in 1991, and I shall conclude with a reflection on what the 2013 general elections portend for the country. HIN LIM, Alvin Cheng-. CAMBODIA RISING: NEOLIBERAL VIOLENCE AND DEVELOPMENT. JATI - JOURNAL OF SOUTHEAST ASIAN STUDIES, [S.l. ], v. 18, p. 61-72, aug. 2017. ISSN 2600-8653. Available at: <https://jati.um.edu.my/article/view/5869>. Date accessed: 24 apr. 2019.